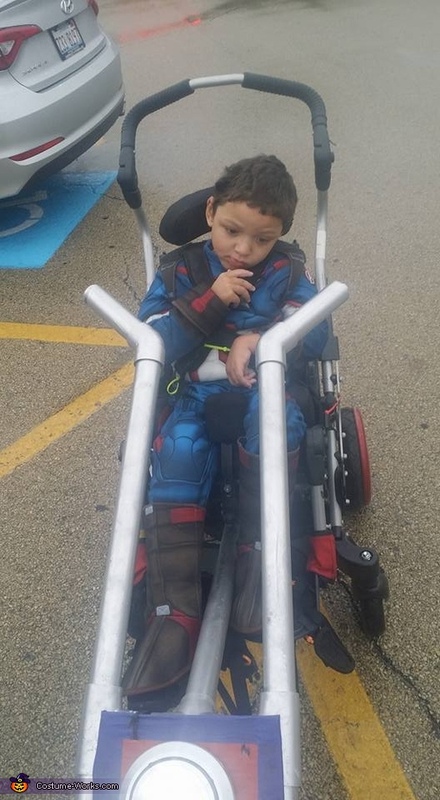 We transformed our son DeAndres wheelchair into Captain America's Motorcycle. We used PVC piping as the frame for the motorcycle. We also used metallic spray paint, a push light, tape, and floral foam wreath base for front wheel and two Captain America shields to cover the back tires. Our son sustained a traumatic brain injury when he was two years old. He was with a family member and she unfortunately hit him and he fell and his head hit the corner of the dresser. She did not get him medical attention in a timely manner and now he has substantial brain damage. We wanted to turn it into a positive so we transformed his wheelchair to fit the costume.